Harvest Fair and a call to arms! Summer playscheme is done and dusted and lovely, we were never fully booked but the kids (and me, Clare and Nikki!) loved it and it showed our fabulous versatile garden is up for everything! BUT we’ve got bad news. We haven’t got either of the big funding bids that would pay for the garden to continue in the same way for the next 3 to 5 years so the money tap gets turned off as our funding finishes March 31st 2014. This was a bit of a blow and means big changes (there’s more info about this on the website in the notes from volunteer meetings page). It means if we want the garden to continue to flourish and thrive, provide a supportive space for everyone, to carry on putting on community events and kids activities then we will need your help. There’ll be loads more info about this at the Harvest Fair on the 14th September 1-4pm and it means this event has now taken on a lot more importance as it’s the last chance we’ll get to tell the community face to face what’s going on and what we are all about. This means your help is really vital. Our lovely events are vital part of our place in the community. We want to wow people with what we’ve achieved – and what we have achieved in 2 years IS incredible- get more people involved and raise money. This is more important than ever as we’ll be asking people to pay to join a ‘Friends of Golden Hill’ scheme as well as looking for new committee members to take on some of the work that I currently do. 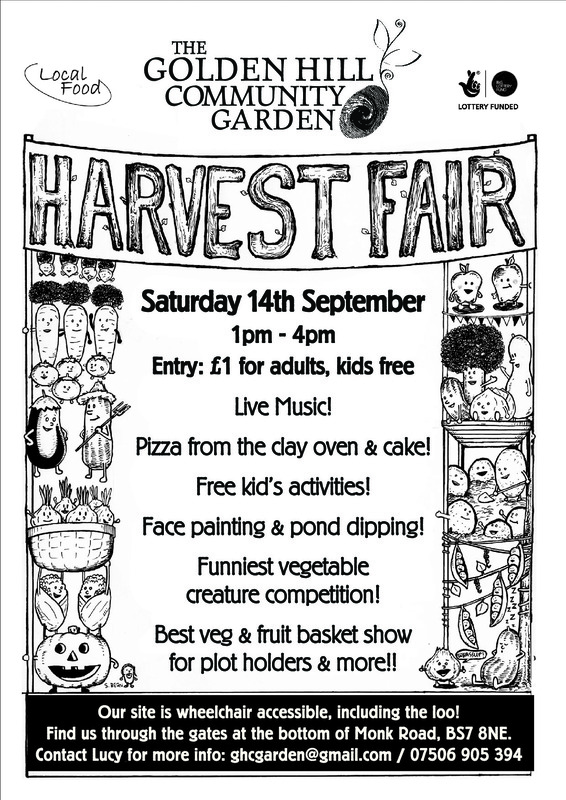 This Harvest Fair will show us if we, as a group, have the energy/will/inclination to keep running community events next year and we also really want to give everyone who comes a really really lovely day. So lovely they fall in love with the garden and give us their time/energy/money! Or if you can think of anything you’d bring along to make the day special then let me know. Also if you can just come along on the day that’s great! bring friends, tell people, spread the word, find us on Facebook -‘like’ the page and share the poster. Let’s do this! Now is the the time, this is your call to arms – your community garden needs you! P.S. Also get involved with the big chutney making happening on the 7th – I’ll send out more details about that next week – but we need your excess veg, apples and a cheerful army of choppers and stirrers! This entry was posted in News from the Garden on August 31, 2013 by GHCG.